It would be hard to overestimate the difficulties the Russian economy faced in 2014. While economic sanctions, the fall in oil prices and the subsequent drop in the value of the ruble dominated the news in the second half of the year, there were also a few bright spots. RBTH presents 9 of the most notable economic events of the year. In April, Gazprom unloaded the first batch of oil extracted at Prirazlomnaya, the world’s only oil platform located on the arctic shelf. The oil is a new type, called ARCO (for Arctic oil), and two tankers had to be built to transport it. Russia’s development of oil resources in the Arctic went ahead despite large-scale protests from ecologists and activists, including Greenpeace, which conducted an action on the Prirazlomnaya platform in September 2013. By 2020, Russia plans to install a total of 25 such platforms in the Arctic. In May, Russia’s gas monopoly Gazprom and China’s CNPC signed a contract worth $400 billion in which Russia will supply China with 38 billion cubic meters of gas annually for 30 years. 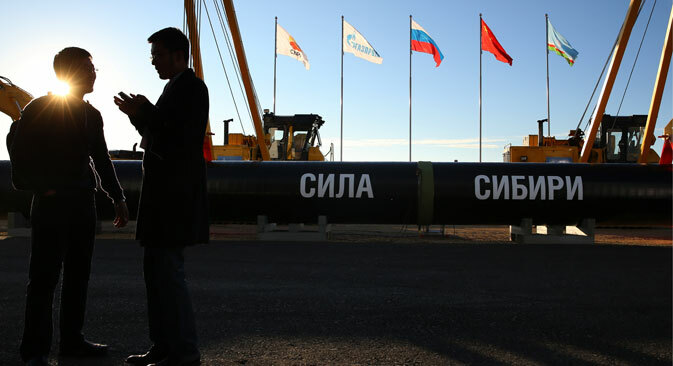 The supplies will be transported through a branch of the Power of Siberia gas pipeline. Construction on the pipeline began in September. The resource base will be the established gas deposits in Western Siberia. According to a study done by Bank of America Merrill Lynch, the contract will start to influence Russia's macroeconomic indicators as soon as 2015. Thanks to this project, the annual volume of investments of the Russian gas monopolist will grow by $5-6 billion. Gazprom later negotiated an additional agreement to transport more gas to China via the Altai pipeline. In June, the Dutch firm Yandex N. V., which owns Russia’s largest search engine, Yandex, started selling shares on the Moscow stock exchange. The move makes it possible to buy and sell Yandex shares around the clock as the company will continue trading shares on the American NASDAQ exchange, where it has been listed since May 2011. Yandex’s NASDAQ IPO, which sold 17.6 percent of the company’s shares and raised $1.43 billion, was one of the biggest IPOs in the NASDAQ’s history. In July 2014, the United States and the European Union introduced sanctions against some of Russia’s largest state-owned companies, including oil major Rosneft; banks VEB, VTB, Sberbank and Gazprombank; and several companies working in the defense sector. The sanctions mean that these companies will not be able to attract funding from American and European banks and investors for more than 90 days. Joint ventures between Russian and foreign companies also fell victim to the sanctions. Russian Finance Minister Anton Siluanov later announced that Russia's losses from the geopolitical sanctions amounted to $40 billion. Russia bans food imports from Europe and the U.S. In response to economic sanctions enacted by the U.S. and the EU, in August, the Russian government banned the import of most fresh foods, including meats, fruits and vegetables and dairy products from Western countries. As a result, Russia lost almost a third of its imported milk and meat supplies, as well as half of its fish and seafood products. As the months went on, grocers and restaurants found new sources of these items from such countries as Argentina, New Zealand and Nicaragua. Other producers found ways to get around the embargo by instead exporting foodstuffs to Russia’s customs union partner, Belarus. Imports of fish to Russia from this landlocked former Soviet republic increased by 98 percent. During the negotiations among members of the Organization of Petroleum Exporting Countries (OPEC) in Vienna on Nov. 27, the group decided not to cut production in a move to prop up falling global oil prices. As a result, the price of oil began to fall further – first by 7.21 percent to $72.52, then to $65 and even $54 a barrel. According to the Russian Ministry of Finance, Russia is losing about $90-100 billion a year because of the decreasing oil prices. A significant portion of the Russian budget depends on oil and gas revenue, and the fall in prices led to a sharp weakening of the ruble. In October, the Bank of Russia decided to try to stop the ruble’s fall in value by sending it into a free float. The bank sold about $30 billion two months ahead of schedule in an attempt to stabilize the currency. After the move, however, the ruble fell further against the dollar and the euro. On Dec. 16, the value of the ruble swung wildly before massive interventions by the Central Bank and state companies stabilized the currency’s value at just under 60 rubles to the dollar. The fall in the ruble has significantly reduced the value of Russians’ income and caused many people to rethink plans for large purchases and vacations abroad. In November, the State Duma approved a bill on the de-offshorization of businesses. Now Russian shareholders will have to pay taxes on the retained earnings of their international companies - including those registered offshore or in foreign jurisdictions. In his annual state of the nation address, Russian President Vladimir Putin promised a full amnesty for capital returned to Russia. In December, Russia made the decision to stop the construction of the South Stream pipeline, which would sent Russian gas to Europe via the Black Sea and the Balkans. Russian President Vladimir Putin explained that the reason for stopping the project was Bulgaria, which refused to grant final permission for the construction of the pipeline. However, the cost of the pipeline increased dramatically in October, which also may have contributed to the decision to cancel the project. Over the past three years, Gazprom had invested $4.66 billion in South Stream. Information from representatives of investment companies Finam Management, UFS IC, Investcafe; analysts from the RANEPA Center of Structural Research; and some of Russia's largest companies, including Rusal, Magnitorgorsk Iron and Steel Works, Novolipetsk Steel, the Cherkizovo Group contributed to the preparation of this report.